Islamic groups vowed Monday to step up anti-American protests over a purported CIA airstrike that Pakistani officials say killed innocent civilians instead of al Qaeda's No. 2 leader. Prime Minister Shaukat Aziz, meanwhile, condemned the strike that killed at least 17 people in a village near the Afghan border, but he said he would go ahead with a planned trip Tuesday to the United States to build business ties. Thousands of Pakistanis poured into streets in cities across the country on Saturday and Sunday chanting "Death to America" and demanding U.S. troops leave neighboring Afghanistan. No protests were reported Monday, but Islamic groups promised more rallies later this week. "There will be more ... bigger protests," said Shahid Shamsi, spokesman for an alliance of Islamic groups. "Pakistani civilians, including children, were killed," he said. "Principles cannot be broken in the name of (fighting) terrorism." Protesters believe Friday's attack was the work of U.S. forces in Afghanistan. Washington has 20,000 soldiers in that country searching for Taliban and al Qaeda fighters, but Pakistan says it has not given the Americans permission to pursue their enemies across the border, but CBS News correspondent David Martin reports administration officials say the operation was approved in advance by President Perez Musharraf's government. "They should try to work to improve their image," Information Minister Sheikh Rashid Ahmed said of U.S. activities in the region. He said the attack "also created problems for this government," including protests from allied parties within the ruling coalition. The prime minister said he is still scheduled to leave Tuesday for the United States, where he will talk about security issues and meet business leaders to encourage foreign investment. Aziz called the airstrike "very regrettable." But, he added, "I don't think that takes away from the fact that Pakistan needs investment." 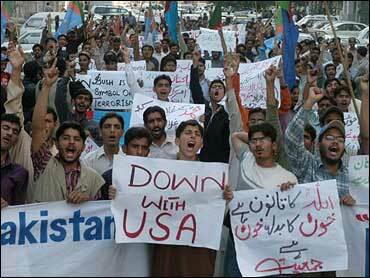 Pakistani officials have strongly condemned the strike, without directly blaming the United States. The United States hasn't confirmed involvement in the attack but Secretary of State Condoleezza Rice said al Qaeda can't be treated "lightly." She praised the Pakistanis as "great allies" in the war against terrorism but said extremists continue to occupy parts of Pakistan, noting that two attempts have been made on the life of President Gen. Pervez Musharraf. On Sunday, two Pakistani intelligence officials said Ayman al-Zawahri, Osama bin Laden's top lieutenant, had been invited to a dinner in the attacked village to mark the Islamic holiday of Eid al-Adha but passed it up and sent some aides instead. Investigators were trying to see if they were among those killed in the attack, which destroyed three houses in the Pashtun hamlet of Damadola, the officials said. They spoke on condition of anonymity because of the sensitivity of the issue. Martin reports U.S. officials say they have evidence Friday's airstrike killed seven or eight senior al Qaeda operatives, but they still do not know if al-Zawahiri was among them. With most of al Qaeda's senior leaders either killed or captured and no sign of Osama bin Laden, al-Zawahiri has taken over as the day-to-day leader, issuing video and audio tapes and writing letters of advice to Abu Musab al-Zarqawi in Iraq, in the process making him more vulnerable to detection. Martin reports that if al-Zawahiri survived, it could be a long time before the United States gets another shot at him since he knows how closely the CIA is tracking his movements. U.S. officials will not say where the intelligence came from that led them to order a missle strike on al-Zawahiri last week, but there is growing evidence that the steady stream of videotapes released by the al Qaeda leader contain clues about his whereabouts, reports CBS News correspondent James Stewart. In the past 12 months, al-Zawahiri has produced seven videotaped messages, compared with only two the year before, and the four most recent have come in an unusually rapid sequence since Labor Day, Stewart reports. A senior army official told The Associated Press that "foreigners" had been reported in the area around Damadola, which is four miles from the Afghan border, but he said there was no information al-Zawahri was among them. Many in this nation of 150 million people oppose the government's participation in the U.S.-led war on terrorism. The strike was one of several recent suspected U.S. attacks along the frontier aimed at militants. Some 10,000 people chanting "Death to America" rallied Sunday in Karachi, Pakistan's biggest city. Hundreds massed in the capital, Islamabad, and in Lahore, Multan and Peshawar burning U.S. flags and demanding the withdrawal of U.S. troops from Afghanistan. Many al Qaeda and Taliban combatants, including al-Zawahri and bin Laden, are believed to have taken refuge in the rugged mountains along the Afghan-Pakistani border. In a speech shown Sunday on state-run Pakistan Television, Musharraf did not address the Damadola strike directly, but he warned his countrymen not to harbor militants, saying it would only increase violence inside Pakistan. "If we keep sheltering foreign terrorists here ... our future will not be good. Remember what I say," he said. Survivors in Damadola denied militants were there, but some news reports quoted unidentified Pakistani officials as saying up to 11 extremists were believed among the dead.